The shift toward higher density living has continued apace across Australia for the past decade, with 2015 marking the first time approvals to build new apartments surpassed that of free-standing homes. These unprecedented figures also mark a lifestyle shift, where more people in Australia’s cities wish to upgrade to high-end apartments rather than larger houses further away from urban centres and amenities. One consequence of this demographic shift is the increasing level of concern among residents about unwanted noise from waste pipes and general plumbing which so often comes with living in apartments. With the quality of acoustic building products available today, noisy pipes and plumbing is not a complaint residents in luxury new apartment developments, or landlords for that matter, are willing to accept. Several years of research and development by Pyrotek led to the development of Soundlag™ products, which have become the choice for many leading acoustic consultants, architects and consulting engineers because of its quality assured consistent performance, guaranteeing quieter pipes. Soundlag™ is a high-performance composite acoustic pipe lagging product consisting of a reinforced aluminium foil faced, mass loaded flexible vinyl noise barrier bonded to a decoupling layer. The product was developed to reduce noise break-out from pipes, valves, fan housings and ductwork in commercial, industrial and domestic buildings. It is ideal for both pipe and duct lagging applications. Working with acoustic consultants and independent test facilities, Pyrotek has designed and tested systems that achieve a very high level of noise reduction for all plumbing and hydraulic situations. Soundlag™ is tested in field and independent laboratories to international standards. 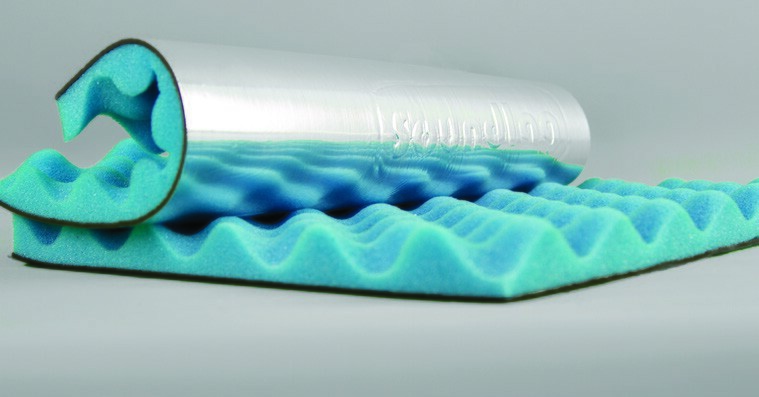 The unique construction of Soundlag™ pipe lagging gives the dual benefits of a noise barrier and a noise absorber. The highly dense and flexible mass layer provides excellent sound reduction properties, whilst the decoupling layer breaks the vibration path between the substrate and the mass barrier, thus allowing the vinyl external wrap to remain flexible and optimise its performance. The external foil facing offers a fire resistant covering and an excellent surface to join adjacent sheets.